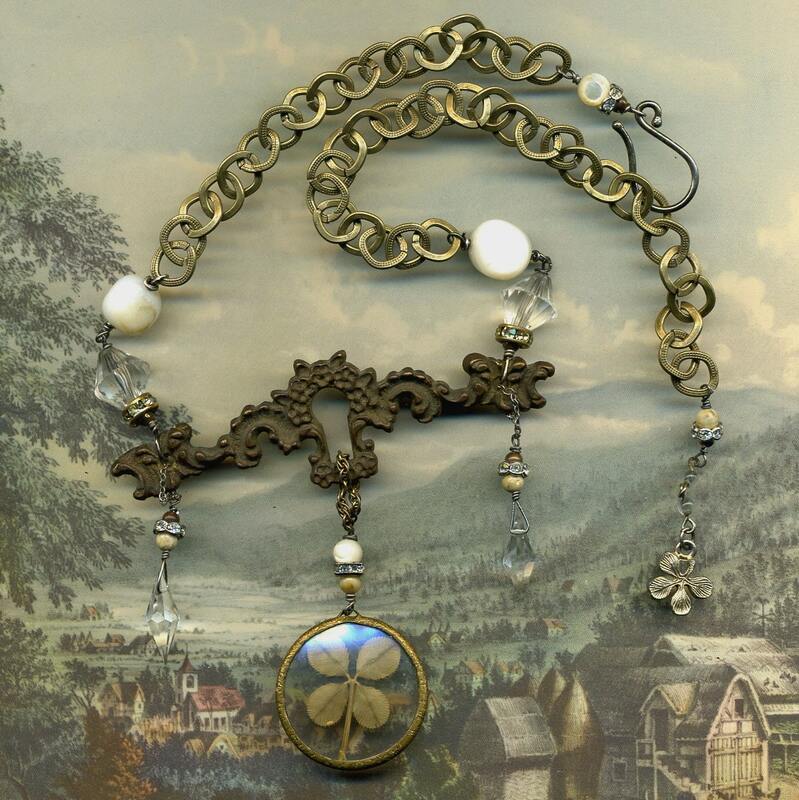 Age Before Beauty offers reconstructed one-of-a-kind vintage heirloom jewelry, currently featuring bigger, glitzier, show-stopping necklaces for the winter months and holiday season. These pieces are made by jewelry artist and illustrator Jennifer Black Reinhardt who recently granted us an interview. I am from a very long line of collectors. Bower bird types who appreciate quirky, odd, old, interesting items with a history. I am a free-lance illustrator who had been searching for an outlet to fulfill my crafty side. When a good friend had on a fabulous necklace which she bought from an etsy artist I was hooked. I was excited to combine my love of quirky collectibles into things I could actually wear. I just love making things. Creating---and the whole process of that. It starts with quiet and daydreaming, and turns into sketching or wire wrapping. Shopping for treasures is awfully wonderful, too! Wearing at least 5 different hats each day and never quite sure what I have on my head at any given moment (sometimes I think it's a gerbil, or a moose, or a chocolate pie, I really never know). I find it really hard to turn my back on the growing pile of laundry needing to be folded, and to make a necklace instead. Actually, that's not true... that's backwards, I find it very easy to turn my back on the laundry and make a necklace instead. And that hat issue again. It IS a gerbil on my head. "Pack Up Your Troubles in Your Old Kit Bag" actually hung on my jewelry 'hand' for a while before I could let it go. I really like it and think it's very wearable. On that same note, I have my very own elk necklace, or I would want "An Elegant Elk". There's something about those curly antlers that I find irresistible. I wanted to illustrate greeting cards and children's books. I remember telling that to my classroom full of firefighters and doctors in the fourth grade. I have always loved to draw, and always known I was an artist. I really love etsy, cindyforrester, ohmymilky,mudstuffing, winonacookie, all different kinds of artists and mediums.... truly everything anyone could be looking for! There's so much creative thinking and fabulous artwork out there------ it's so hard to edit! I will continue to work relentlessly to get my children's books published. In the meantime, I've been doing some wonderful freelance illustration work. Annnnd, of course I hope that I always get to turn forgotten baubles into timeless jewels. Visit Age Before Beauty now to see more fun jewelry or visit Jennifer's blog for a peek at the illustration work she's been doing.